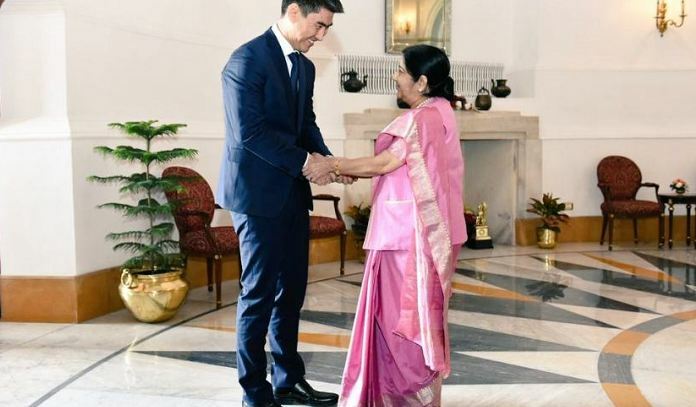 Chingiz Azamatovich Aidarbekov, Foreign Minister of the Kyrgyz Republic, on his first ever official visit to India on 27-31 January, met External Affairs Minister Sushma Swaraj on January 29th. The two Ministers held wide-ranging discussions on bilateral, regional and multilateral issues of mutual interest. Noting the close cultural and historical ties between India and Kyrgyzstan and reiterating the importance the two countries attach to their bilateral relationship, the Ministers agreed to expand India-Kyrgyz cooperation in a number of areas, particularly in the field of development partnership. Foreign Minister Aidarbekov briefed EAM on Kyrgyzstan’s efforts to liberalize its economy, create business friendly conditions and attract foreign investment including that from Indian companies. Giving an overview of new infrastructure projects in Kyrgyzstan, including in the fields of railways and hydro-electricity, Foreign Minister Aidarbekov invited India to participate in such projects. Presence of more than 9000 Indian students in various Kyrgyz educational institutions was noted in the context of the potential to enhance cooperation in the field of education by encouraging collaboration between universities of both countries. Defence cooperation, capacity building, training, IT and e-governance, healthcare and pharmaceuticals, tourism, movie production and culture were also discussed. Foreign Minister Aidarbekov and External Affairs Minister both highly valued the initiative of the India-Central Asia Dialogue at the level of Foreign Ministers with the participation of Afghanistan which was held in Samarkand, Uzbekistan on 12-13 January 2019 as creating a platform for region-wide cooperation which would bring benefits to all the participating countries in terms of enhanced trade and economic cooperation and connectivity. Foreign Minister Aidarbekov said that he looks forward to participating in the next edition of the Dialogue which would be hosted by India in 2020. Acknowledging the threat posed by terrorism and radicalization to their societies, the two Ministers agreed to work together to fight the scourge of terrorism and cooperate in exchanging experience in the field of deradicalization. Cooperation in the United Nations and the Shanghai Cooperation Organization (SCO) was reviewed in detail. External Affairs Minister conveyed her best wishes and support to Kyrgyzstan in its work as the SCO Chair this year and for the success of the SCO Summit which the Kyrgyz Republic will host in coming June. The Kyrgyz Foreign Minister reiterated the invitation extended to Prime Minister for participation in the SCO Summit and paying a bilateral visit to the Kyrgyz Republic. He also invited External Affairs Minister to visit Kyrgyzstan. EAM had visited Kyrgyzstan earlier in August 2018. Earlier during his visit, Foreign Minister Aidarbekov called on the Vice President of India and the Minister of State for Finance Shiv Pratap Shukla. He is scheduled to pay a visit to Taj Mahal before returning to Kyrgyzstan on 31 January.